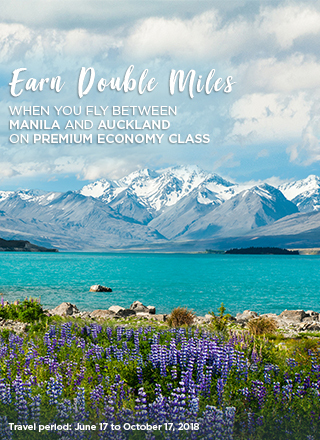 Fly on Premium Economy between Manila and New Zealand and earn DOUBLE MILES! Applicable only to Fare brands booking class codes (BCC's) specified above. Accrual percentages and eligible BCC's are subject to change. Double Miles offer is valid only on qualifying booking class codes on paid flights indicated on the table above. Flights must be marketed and operated by PAL. Miles must be credited to member’s Mabuhay Miles account in order to earn Double Miles. Travel must be from 17 June to 17 October 2018. Not valid on any type of Travel Award and/or non-revenue tickets. Double Miles shall not count towards Elite-tier qualification. Double Miles shall only be extended once ticket/route has been flown. Please allow at least 48 hours for Miles to be automatically credited the member’s Mabuhay Miles account. Otherwise, standard retro-crediting procedures and handling shall apply. All terms and conditions of the Mabuhay Miles program apply.